4Easysoft Apple TV Video Converter is the excellent Video to Apple TV converter software to convert all video files such as AVI, MPEG, WMV, MP4, MOV, RM, ASF, 3GP, VOB, etc, to Apple TV movies. Also this Apple TV Video Converter can extract audio MP3, AAC, etc. from video files. To enjoy video on Apple TV comfortably, 4Easysoft Apple TV Video Converter provides you with powerful editing features to recreate the Apple TV video before converting. Various video and audio parameters are provided by this Apple TV Video Converter for you to select for the output video. 4Easysoft Apple TV Video Converter enables you to convert video to Apple TV freely. This software can accept all popular video formats like MP4, AVI, MOV, VOB, WMV, MTS, MKV, MPEG, H.264, RM, SWF, FLV as well as HD videos to Apple TV supported video formats..
Plus, this Apple TV Video Converter can help you extract audio from video files you select and convert among audio files for you to listening to the music on your Apple TV. 4Easysoft Apple TV Video Converter is available for you to convert your video to various popular formats only one time. 4Easysoft Apple TV Video Converter can assist you to change the video visual effect by adjusting the video brightness, contrast and saturation. Trim any segment of your movie by setting the start time and end time or dragging the slider bar. This Apple TV Video Converter can also join several interesting clips into one. to double your movie enjoyment. With this Apple TV Video Converter, you can cut off the black edges of video and set the aspect ratio by keep original/ full screen/16:9/4:3. This Video to Apple TV Converter provides you various parameters: Video Encoder, Resolution, Frame Rate, Video Bitrate, Audio Encoder, Sample Rate, Channels and Audio Bitrate. You also can save all the output settings as your preference, which is saved in the user-defined column automatically. Using 4Easysoft Apple TV Video Converter, you can add watermark for your video in form of text or image forms. The position and transparency can be specified for your preference. An intuitively designed user interface of this Apple TV Video Converter brings you more convenience and enjoyment. With professional and advanced technique, 4Easysoft Apple TV Video Converter can help you convert video to Apple TV with fastest speed and best quality. 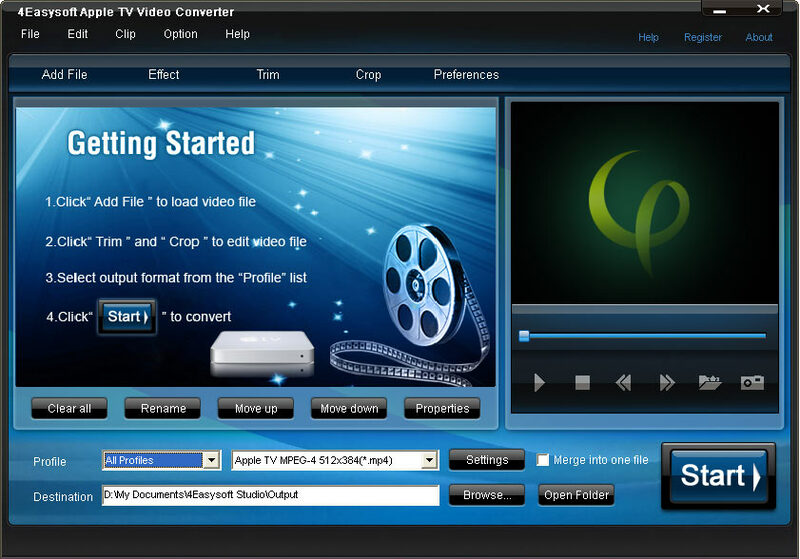 Convert your video to different output formats for only one time conversion. Add different text or image watermarks to meet your needs. Additional function of choosing subtitle and audio track.